We’ve all heard stories about enormous deep sea worms and sharks the size of a city bus. It turns out, those aren’t the only incredibly huge creatures hiding beneath the waves. A team of researchers in Hawaii have discovered the largest sea sponge known to science, and it’s as big as a minivan. Located near the Papahānaumokuākea Marine National Monument, the sea sponge is thought to be several centuries old, if not more. The expedition took place in the summer of 2015. Researchers aboard the National Oceanic and Atmospheric Administration (NOAA) ship Okeanos Explorer, led by research specialist Daniel Wagner, Ph.D, discovered the huge sea sponge while exploring the deep water habitats surrounding the national monument. With the aid of remote-controlled vehicles, the expedition stumbled upon the 12-foot by 7-foot sponge at depth of 7,000 feet. That makes it the largest sea sponge ever found, by a long shot. When it comes to determining how old this record-breaking sea sponge might be, it’s a little tricky. Some of the largest sea sponges found in shallower waters are known to live as long as 2,300 years. Further studies might help age the sponge, but for now, researchers are just thrilled to see it thriving at a time when so many marine creatures are struggling to survive. The results of the study were published recently in Marine Biodiversity. 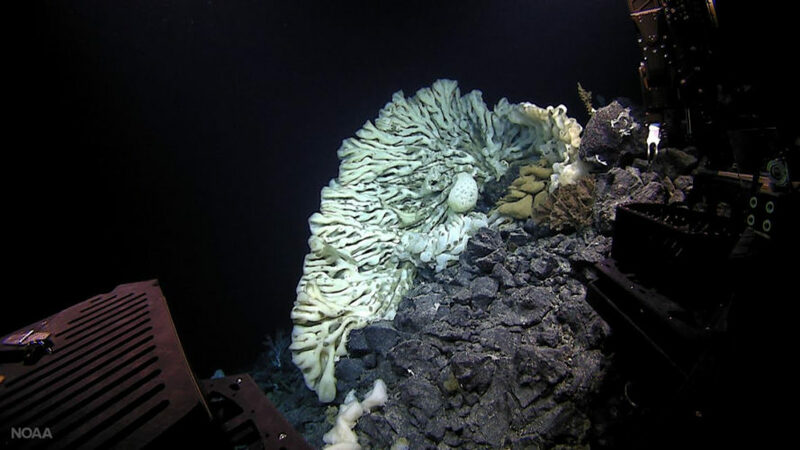 Deep sea researchers discovered a sea sponge in Hawaii the size of a minivan, the largest on record.